The kettlebell (KB) thruster is a total-body, multi-joint exercise designed to improve strength and power performance. This exercise can improve your ability to transfer energy from the lower to upper extremities, and serves as a great general muscular conditioning exercise for the whole body. 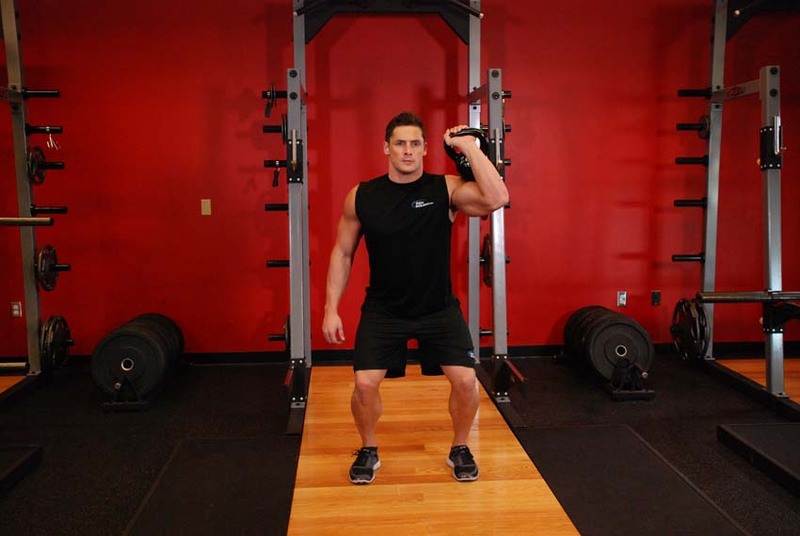 Because many sports involve multiple movements that require high-power output, the application of the KB thruster into an athlete’s training program may be beneficial. Additionally, KB training is a space- and time-efficient method of training that can be used with a variety of age groups and experience levels. Here’s a video that demonstrates proper exercise technique for the kettlebell thruster exercise. Variations of the KB thruster exercise include performing the exercise with two kettlebells, dumbbells, or resistance bands with handles. To maximize your calorie burning efforts, choose big exercises that skyrocket your heart beat and leave you panting for breath. Choosing more intense full-body exercise enables you to burn more calories in the same amount of time. Some great exercises to try out: kettlebell swings, goblet squats, burpees, and any move that makes you quickly move up and down, and back and forth. Instead of spending extensive periods of time on a treadmill, elliptical, stationary bicycle, etc., try breaking up your cardio into multiple short rounds. 2-minute intense rounds of work has a positive impact on heart rate, body temperature, and breathing without greatly hindering your strength or power later in the workout. The only catch… you must go all-out for each 2-minute round. No slacking. Finish of your fat-burning session with a a full body exercise, such as the farmer’s walk. This is such a great finishing exercise as it is a repeatable, moderate finisher that forces every muscle to work in unison for a long time. The result: more calories burned. You’ll want to do this for 10 to 15 minutes at the end of your session.